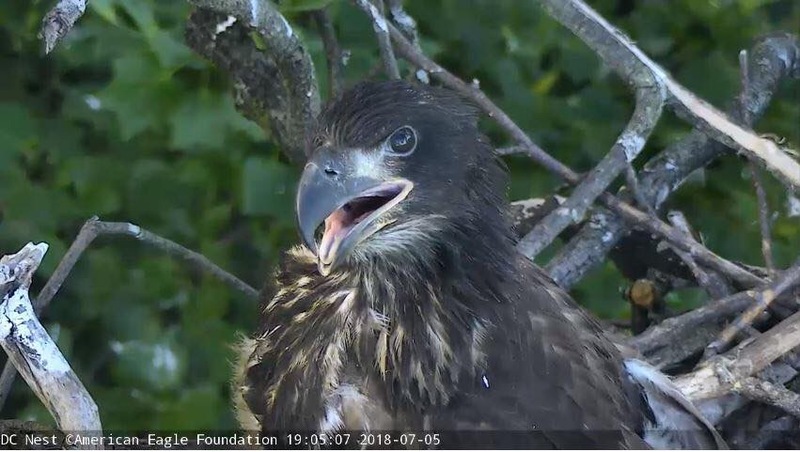 From the moment he hatched on May 3, 2018 through every stage of development, Valor was a perfect young eaglet. Safe and secure in the nest atop a Tulip Poplar tree, we saw only a clear road ahead and an eventual successful fledge. Food was plentiful, Mr. President and The First Lady were skilled and devoted parents, and sibling rivalry wasn’t a major problem. But an unseen danger came calling. We received the necropsy report on August 21, and the findings confirm several things: First, Valor was indeed male. Second, West Nile Virus had caused severe softening and swelling in one area of his brain, which accounts for his neurological symptoms. Some evidence of parasites in the gastrointestinal tract was found, but this is very common in wild birds, and in this case, likely had little to no effect on his condition. Finally, tests for Influenza A as well as multiple toxins were negative. 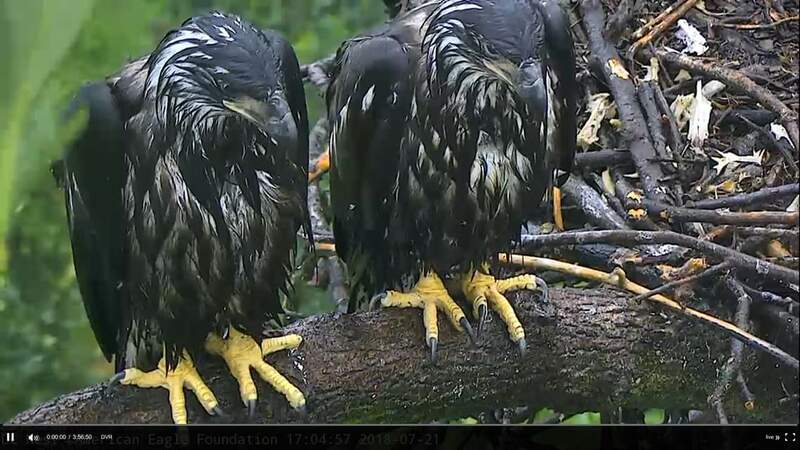 Valor first fell from a branch on the nest tree on early Thursday morning (1:00 a.m. EST), July 26, and was discovered “waterlogged” on the ground later Thursday morning, according to DOEE wildlife biologist Dan Rauch. Valor was found waterlogged on the ground July26. Photo by Sue Greeley. After Valor’s spill, he was spotted standing on the ground near the nest tree. Later Valor was observed flying beautifully up into a Sycamore tree, only to disappear again on Friday night. This time, Valor was not found in the Arboretum. 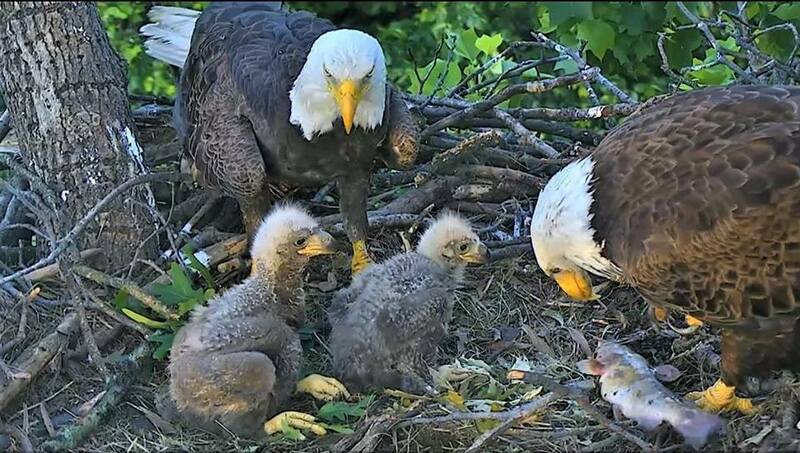 Rauch said that’s when they began to worry and search for the eaglet. 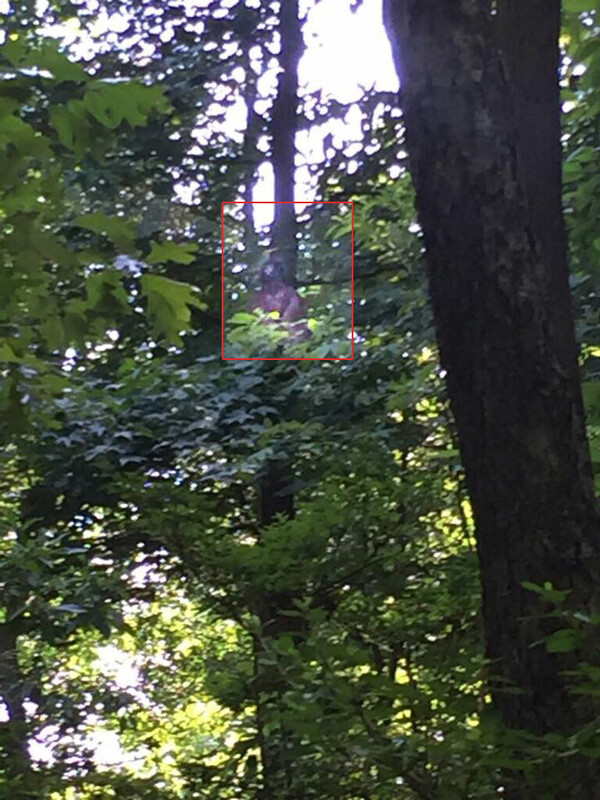 Valor was spotted in a nearby sycamore tree on July 26. Photo by Dan Rauch. 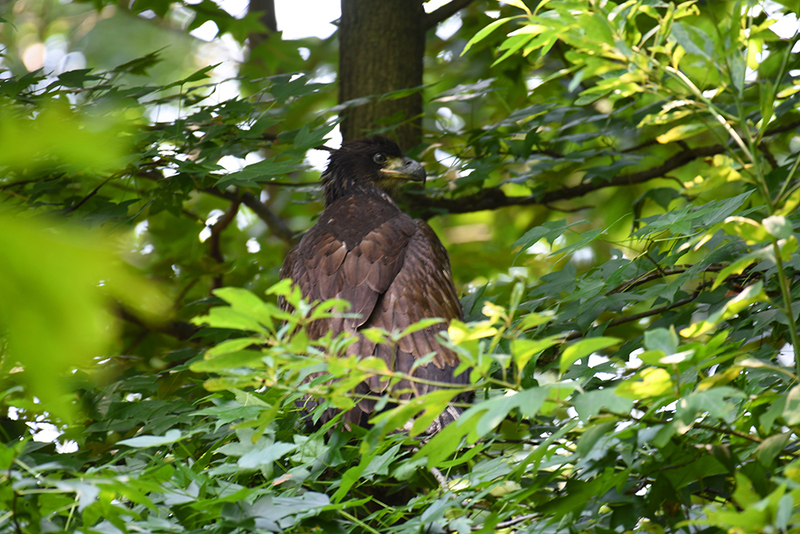 On Friday, July 27, Valor had moved into the area of the primary perching tree and was at least 70 feet up with Mr. President perched nearby. Valor was spotted in a nearby tree 70 feet up. (see area within red marker) Photo by Dan Rauch. On Monday, July 30, Rauch heard some calls near the border of the Arboretum that might have been Valor, but couldn’t find anything when he searched the area. 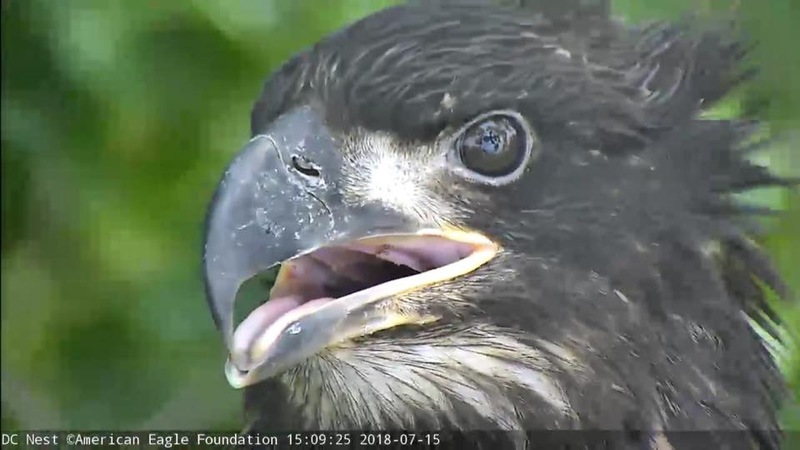 A few hours later, calls began coming into the Arboretum from concerned D.C residents just a few streets from the nest. Rauch, who was nearby, went to the scene. And there was Valor, sitting on the sidewalk. Valor was moved to Tri State Bird Rescue and Research in Delaware August 2. 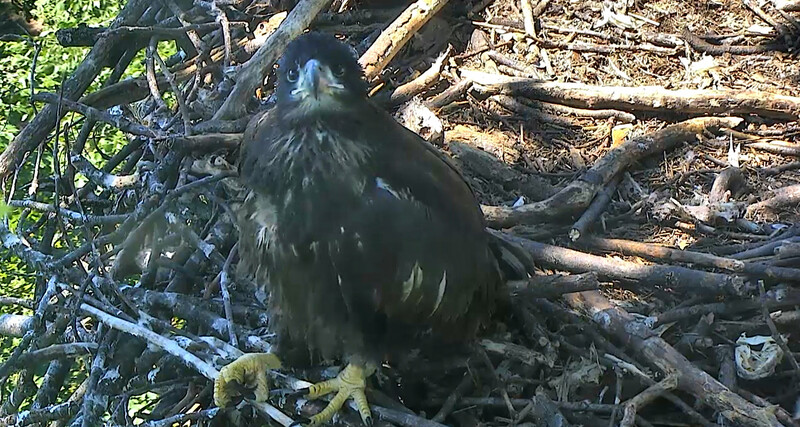 Tri State reported that the eaglet was in very poor condition, was anemic and underweight with developmental issues. Tri State’s update on August 6 revealed that Valor’s condition showed no improvement and the prognosis remained guarded. 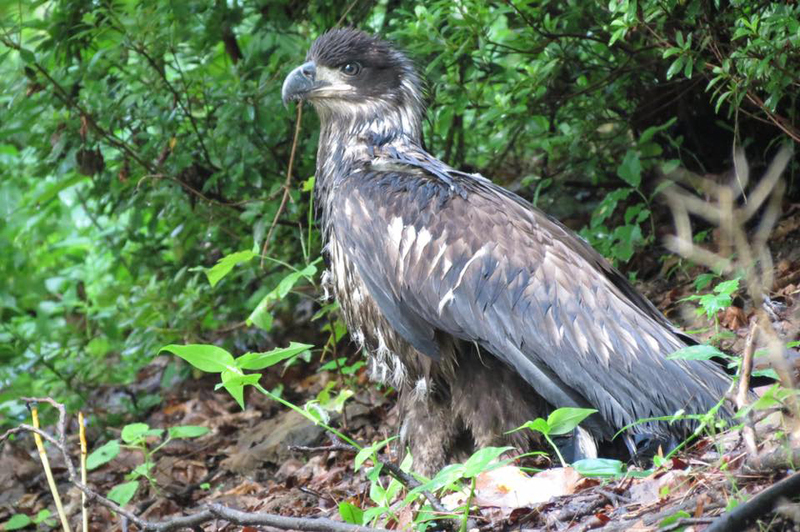 On August 7, Tri State made the determination that subjecting Valor to further treatment, handling, and captivity and prolonging the eaglet’s suffering would have been inhumane and contrary to their principles as wildlife rehabilitators. Valor was humanely euthanized on August 7. 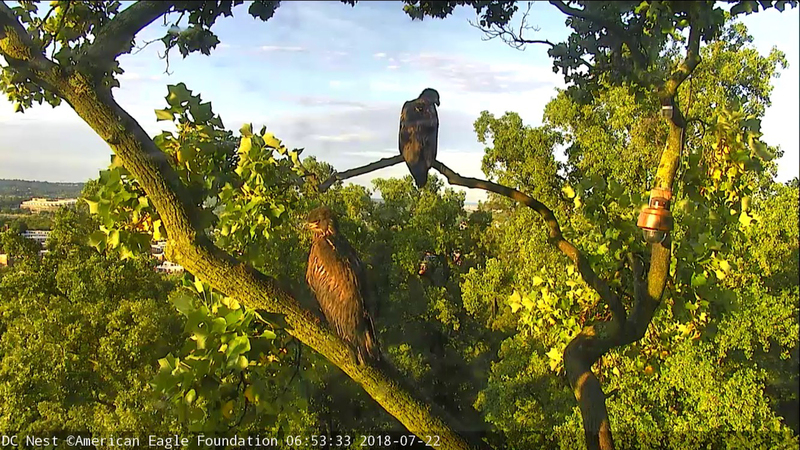 On a beautiful day in July, Victory & Valor survey their world from the nest tree. What are you doing, Valor? “Valor, your time with us here on earth may have been short, but in that time you managed to carve out a place in my heart and nestle yourself right on in. This was not the ending any of us envisioned and my heart hurts over your loss. But I have wonderful memories of you that I will cherish always, and those will help ease my pain. There is a song by Trisha Yearwood, titled ‘I Would’ve Loved You Anyway’, about the loss of a relationship. I think these lyrics sum up how I feel. “My last, happiest memory of Valor occurred five days before Valor’s fledge and, of course, it was raining. Victory and Valor stood perched together on the lateral branch for a very long time, like bookends, in harmony and almost as one. Thus is how I will remember our precious Valor, as his spirit lives on in Victory. “We knew we loved Valor even before hatch, but who could’ve guessed we would grow to love him even more?? 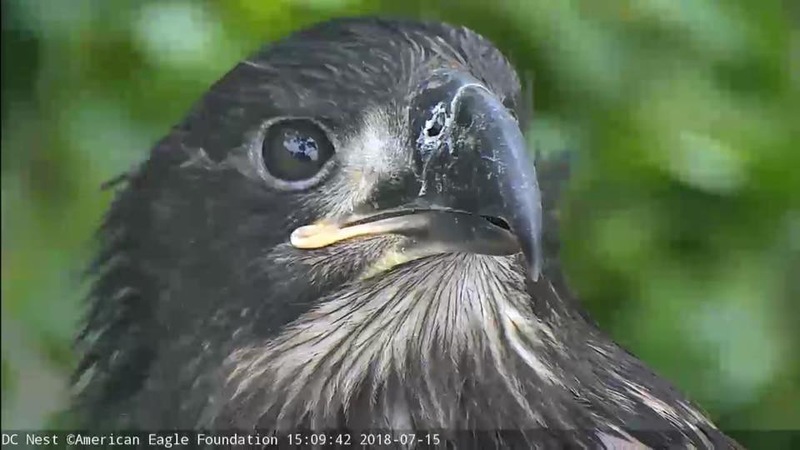 I am thankful to have had the opportunity to watch this special eaglet grow and develop that cute personality, and as a cam op, it was a privilege to share his progress and beauty with everyone. I will never forget the adorable early morning antics between Victory & Valor, when Victory would lovingly pester Valor, like human siblings do. Whether Victory was allopreening Valor, picking at Valor’s feet, etc., it always made me smile. 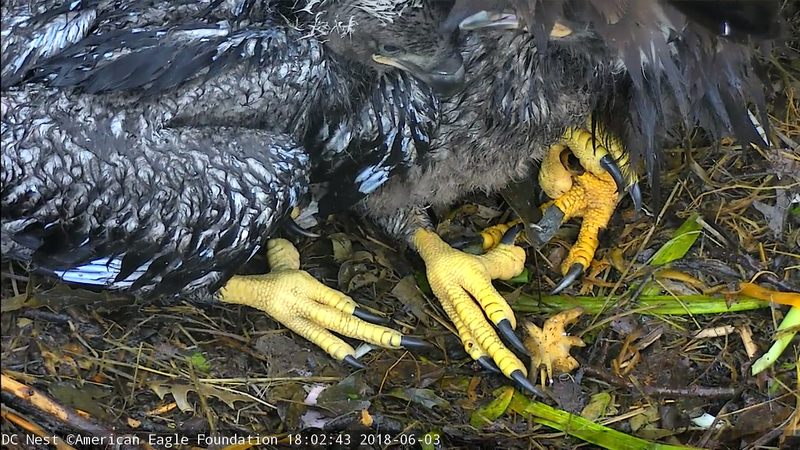 Meal time was also entertaining as we cheered for Valor when he became a stealthy eaglet, going under and around The First Lady to get food. How many times did we all yell, “Way to go!” when he swooped in and grabbed the fish before Victory had a clue!? Countless happy times! still – in each new dawn. 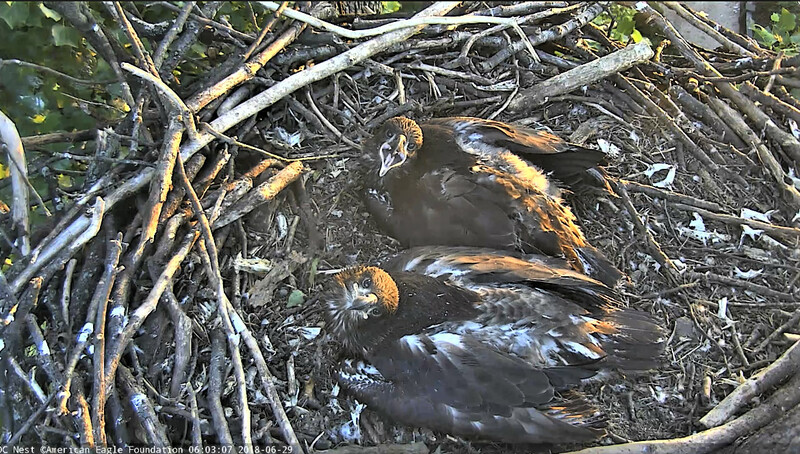 Valor and Victory lie cuddling together, basking in the golden sun. “Rather than an event, for me, it’s more about the sweet eagle spirit who we named Valor. What made Valor so special and such an endearing character was an easy going nature, how s/he always went with the flow and never fussed about the small stuff. 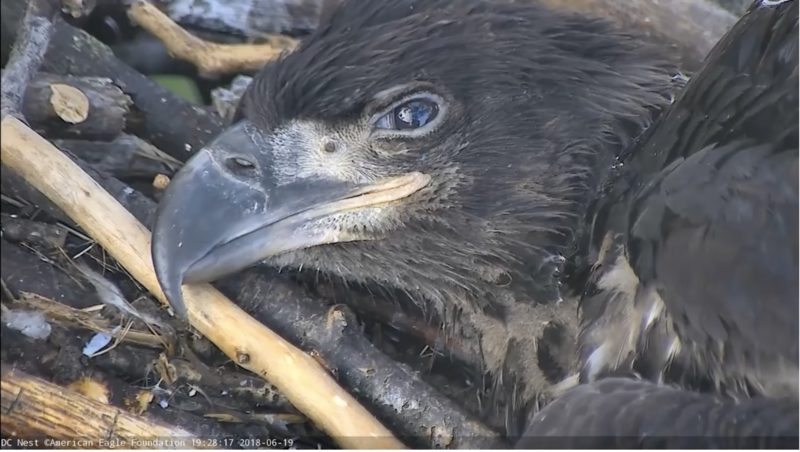 When I think of Valor as a little glossy puff of white fluff, I think of how MrP covered both eaglets up on more than one occasion. Digging little potted plant type holes in the nest and then covering them with moss and grasses to keep them warm and protected. 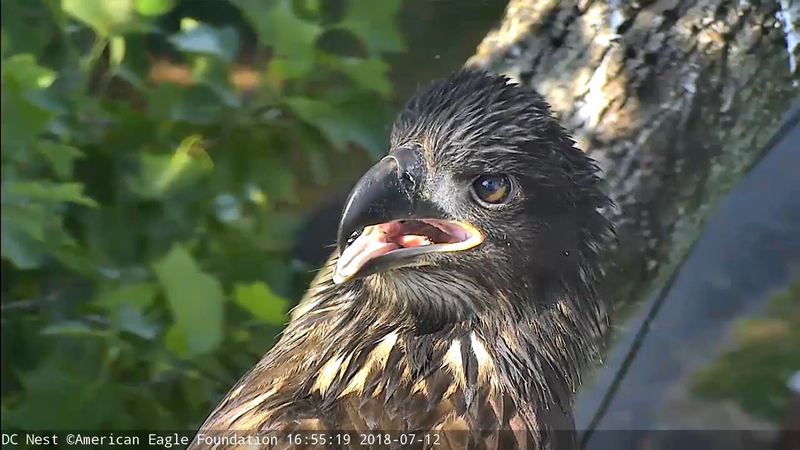 A couple times Valor completely disappeared from sight, but that never seemed to be a concern, soon enough Valor would pop back up for a feeding or to wander about the nest. I loved watching Victory and Valor’s friendship grow. 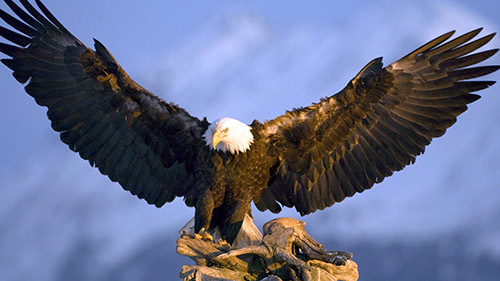 I envision Valor lying in the nest, with one leg sprawled and stretched outward like royalty, claiming comfort and space, and Victory’s open wing stretched out over the top of Valor. 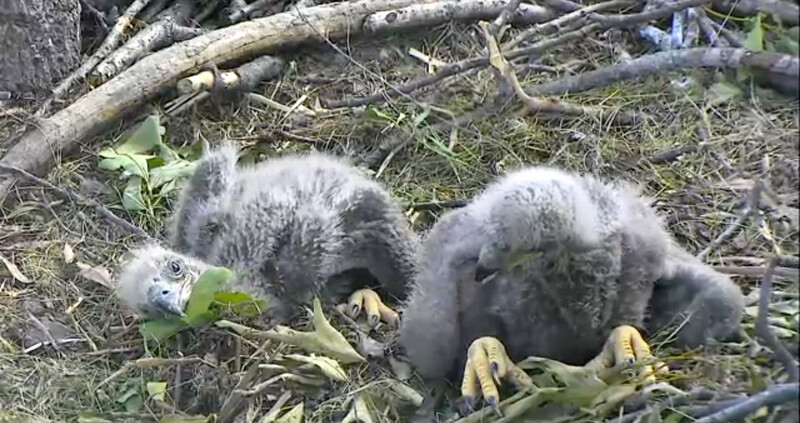 I can still see them snuggling and beak kissing. How I loved watching them beak to beak staring into one another’s eyes, tilting their heads sideways and checking each other out. 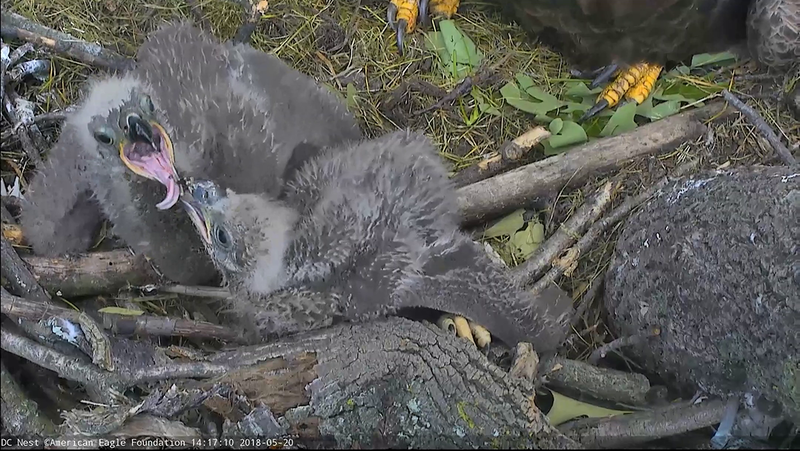 And the adorable games with sticks, as they’d pass the same stick back and forth, wrangling and moving it about the nest. Valor’s chill nature was particularly tested the day Victory was having a blast wingercizing around the nest and not paying attention (which s/he regularly did). Victory accidentally landed on Valor’s back and almost pushed Valor out the V. Valor just shook it off once balance was regained and carried on as if nothing had happened. But Valor also had a particular way to get back at Victory whether it was meant as pay back or not. Valor seemed to have a thing for tongues and it took me by surprise when I watched Valor nip and pull at Victory’s tongue more than once. I’d never seen that trick before and to this day, it makes me laugh. “The moment that Valor came out of the egg, I knew he would be my favorite. Valor’s personality was quiet, reserved, strong, and impressively brilliant! She/he was an underdog from the get-go and that is why I fell more in love with him/her as he/she stole my heart. I distinctly remember the day it was raining, 6/3/2018. TFL had left the nest and we all got a glimpse of Valor and Victory. I was on Cams and for the first time, saw Valor shiver and he/she would not stop shivering. Valor was soooo cold! But I saw Valor endure the cold and pull him/herself completely under TFL and tuck in to stay warm. Victory was pushed to the outside and was receiving most of the rain. As I zoomed in, I saw Valor’s talons holding TFL’s talons and Victory’s. It looked like a mesh of talons. I knew, at that moment, that Valor would be warm enough and be okay through the cold, wet rain. 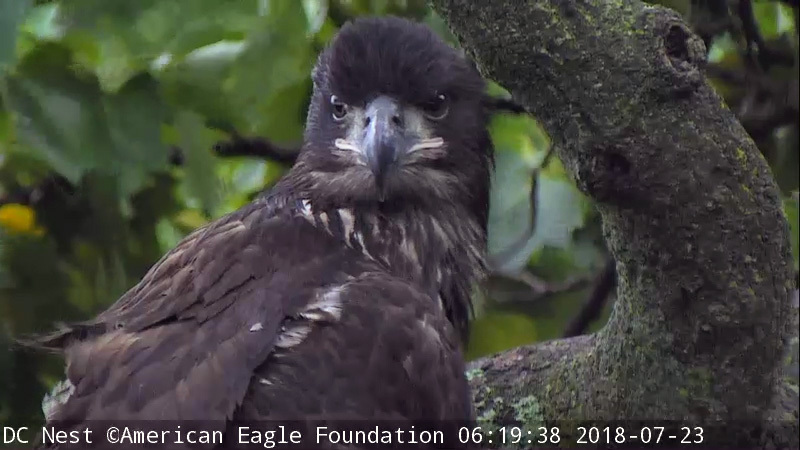 This season, before we lost Valor, there was another young eaglet named Flyer, who had just fledged and was barely beginning to learn to soar. Flyer was from the Dayton, Ohio nest of Jim and Cindy (now Jim and Hope)— and many of our viewers know this nest and have followed Jim Weller’s blog post about Jim and Cindy / Hope. 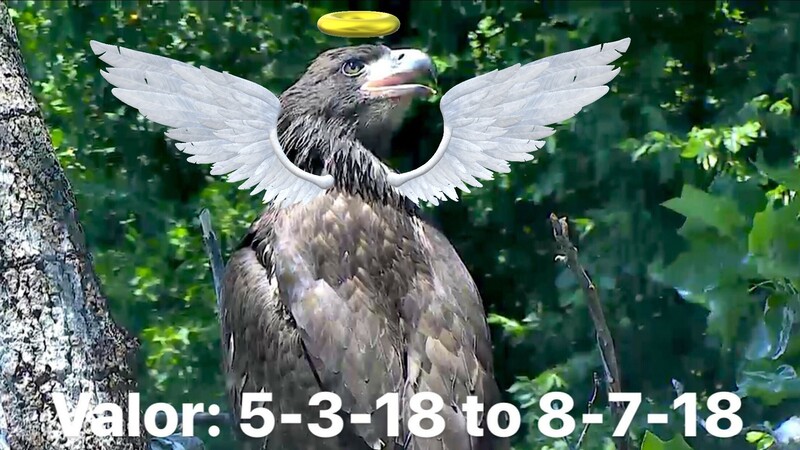 Triumphs and tragedies are not limited to one nest, and when Flyer was killed while flying too low across a busy highway, Jim remembered a poem he had penned a decade ago when his eagles, Jim & Cindy, had lost their eaglets. With Flyer’s tragic death, Jim brought the poem back for us. He also wanted to honor Valor, and has given permission for us to reprint it here. Their freedom makes hearts glad. To their nest and Dayton’s story. Of their precious, feathered pair. Does not survive the test. And chain man to the ground. Earthward to me and you. In the screaming eagle’s song. And free your heart to soar!